Welcome to the Hostel Cisco, located in the heart of the vibrant city white of Arequipa – Peru. Choose to stay in one of our elegant guest rooms or pick from 9 different bedrooms types all with beautiful views to Misti Volcanium. As well as an extensive tours offering, the hostel Cisco has two stylish terrace coffe for guests to enjoy. So whether you are staying for leisure or are here on business, you can rely on our services to accommodate all your needs. A lot of travelers pass right by Peru's second-largest city. But for anyone who takes the time to get off the bus and explore, you'll find back streets and inviting alleys filled with historical sites, culinary magic happening in little restaurants, a hip nightlife scene, gorgeous inns, and inspiring outdoor excursions to nearby volcanoes and to some of the world's deepest canyons. 2 hours to reach the top of the mountain by car, 3 to 4 hour descent, very irregular soil, stones in the first part, sand in the second and highway the third. Medium dificulty, I hardly recomend previus experience in downhill or mountainbiking, no matter what the tour operator says, definetely not a ride in the park. Great place for biking! Quick stop on the way to Colca Canyon. If you like buildings, this is the place for you. Personally, I wouldn't stop by again. 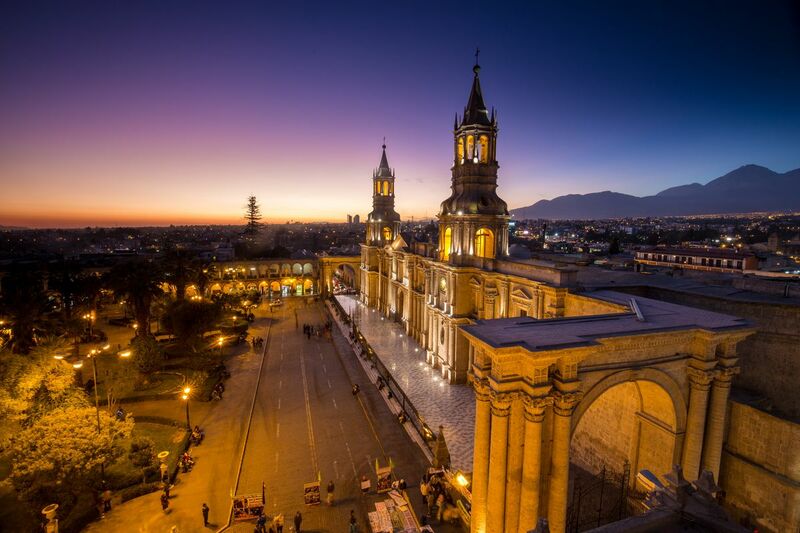 Arequipa aka The White City, is Peru's second city. With amazing buildings & architecture the historic centre is a joy to stroll around. From the magnificent Cathedral to the Santa Catalina Monastery there is lots to see and do. Great food & friendly people & watching the sunset was an added bonus on my visit here. Beautiful Spanish Colonial Architecture, and set in a lovely valley with great weather. Arequipa is a charming city, and one I would highly recommend checking out.